You've worked hard on your genealogy. You've made some fantastic discoveries. But what do you actually do with it? Those discoveries don't do much good just sitting in your file cabinet or on your computer. That's where 52 Ancestors in 52 Weeks comes in. There are two common problems that I hear from people: They don't like the prospect of writing a book or they don't know what to write about/share with others. That's why I came up with 52 Ancestors in 52 Weeks. What Is 52 Ancestors in 52 Weeks? 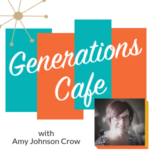 It's a series of weekly prompts to get you to think about an ancestor and share something about them. The guesswork of "who should I write about" is taken care of. How to Participate in 52 Ancestors in 52 Weeks? You can blog, post on your favorite social media, send an email to your cousins -- whatever you want to do to share something about that ancestor. The point is to get you to take that knowledge that you have and the discoveries that you've made and get them out of the filing cabinet/computer/pile of papers and do something with it. How you share it is up to you. Do I Actually Have to Write Something? Not if you don't want to! You could share a photo, make a video, record yourself talking. The point is to do something. Does It Have to Be an Ancestor? No. You could write about a collateral relative or even yourself. (Remember, you're part of your family history, too!) The prompts are designed to be flexible and open to your own interpretation. There isn't a "52 Ancestors Police" who is going to be watching over you. How Can I Get the Prompts? Just click the button below to sign up. Make this year the year you do something with your genealogy! Join the 52 Ancestors in 52 Weeks Challenge! This entry was posted in Announcements and tagged 52 Ancestors, 52ancestors by Amy Johnson Crow. Bookmark the permalink. I’m very excited to be joining this for the first time. I’ve made some pretty significant breakthroughs this year with the help of DNA, one of which was a 106 year old mystery (determining the father of my paternal grandmother)! Thanks for doing this! Bragging here – I just finished four years of 207 ancestors in 207 weeks. They are not great writing, they are incomplete as far as records found and described, but they provide a starting point for further research and perhaps books or articles later. The biggest benefit has been the discipline of writing about an ancestor every week. I revisit all of my previous research, then search for more records for the person, collect the record images in one family file, update the person profile in my RootsMagic family tree database, add events, media, stories and sources to the profile, identify resources to find next, and write the post. I chose to work backwards in time starting with my great-grandparents, using my ahnentafel numbers. After four years, I am in the middle of my 6th great-grandparents. Today’s post was for #286 on my ahnentafel list – I skipped the ancestors whom I don’t know anything about. I’ve only missed two weeks in four years due to real life events – and look forward to doing at least through the 6th great-grandparents. Randy, you should be on a poster for 52 Ancestors! I’ve been in awe of your dedication to the process! Good job, Randy. You inspired me to do the same last year via a blog. marjfam@blogspot.com This year, I am adding another blog for my husband’s ancestors! rcs.blogspot.com It’s fun! Good for you. I made all 52 weeks in 2018 even with breaking bones 2 different times! Sure wish some geek could make a list of all of us participating by posting on blogs in 2019. I love reading how others handle the prompts. I agree Myra. If I had 50 hours in the day I would spend about 20 of them reading blogs on research. Very inspiring! (have to sleep sometime!). I had to step away for a few months but am stepping into it again. I’m glad you’re doing this again! This sounds like a great way to revisit an ancestor. I was just talking about this with Linda Stufflebean. I have facts on ancestors but no story put together using a timeline. This would be a great way to start. Thanks for doing this Amy. I am excited about this. I just started blogging to share my tree info with family members a few months ago. I am finding that digging deeper into my ancestor’s lives for the blog posts is giving me a much better understanding of their motives and decisions. As a newbie, I am looking forward to learning from the posts of others! I’m looking forward to this. Thank you. Looking forward to this. I have been in a genealogical slump for awhile now. Ready to give it another go. Thank you. Excellent. Thank you for doing this and some tips in Randy’s comment to boot. 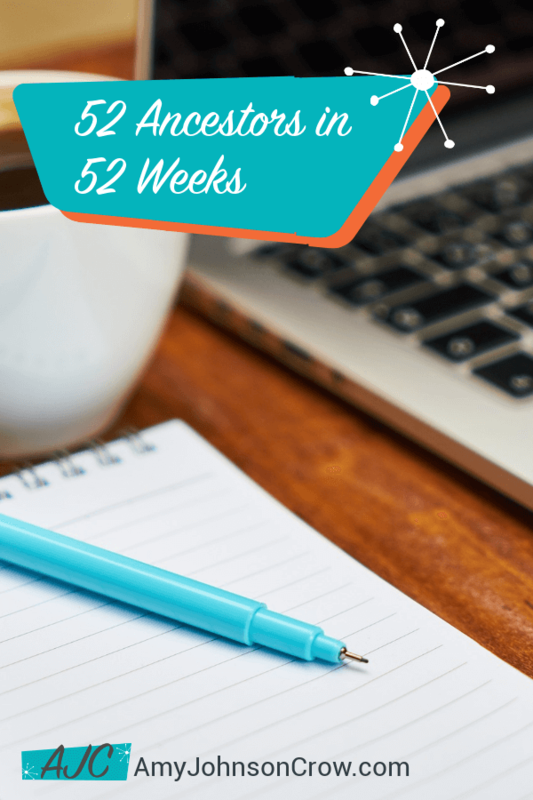 I’ve just completed the 52 week blogging challenge and mostly wrote about my life and now converting it to a scrapbook for my children for next Christmas. Some of my followers wanted to know what’s next, well, this is it, 52 Ancestors in 52 Weeks. Ready and waiting. THANK YOU. Ooh – incentive to get me blogging again! Thank you! I too am joining in for the first time ever. I am also going to do this on the G2G forum at Wikitree. That is MY “social media”: and also where I have hung my family tree online. I loved this before and never stopped. So glad to see that you’re doing this again!! It looks like I will finally do the 52s. 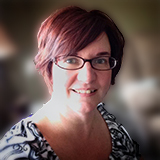 There is a bunch of us, thanks to Robynne Lozier, that are going to use Wikitree as our platform via a weekly thread on the WikiTree forum (G2G). Like Randy Seaver, I will follow an ahnentafel list, however I am not going to skip anyone. I admire how Roberta Estes weaves her DNA findings into her 52’s. Here is the WikiTree link to our 52s. This sounds like a great idea, so I signed up! I am relatively new to genealogy, but I was sucked into it once I took a DNA test or two and discovered my people. 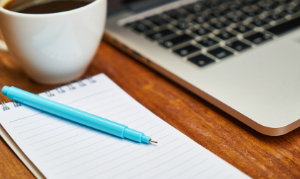 Where is the best place to start a blog for genealogy? Would a WordPress account be ok or someone posted about a wiki tree account? You don’t have to blog. You could even just keep a journal (paper or electronic). The point is to get things out of our genealogy software and our piles of papers and get it into a format that can be shared. Send emails to your cousins. Make a scrapbook. Whatever works for you! I’m excited to join this year! Thank you for doing this, Amy! Glad to have you participating! I am terrible at writing and have only been doing genealogy for 4 years. But I am willing to give it a shot and see what, if anything I can accomplish. Thank you and Happy New Year everyone. I like your “can do” attitude! Thank you, at almost 70, I try to accomplish as much as possible. I’m glad that you are doing this. I’m praying that this will get me back to blogging and back to my research. Since my dad died in 2011, I’ve been struggling to get back to both. I saw this posted in a FB group and decided to sign up. I started a genealogy website last Jan. At some point, I thought I would write some articles but that fizzled out fast. This will be perfect to get me writing about some of the more interesting things that I have found. I am looking forward to starting. What day should we post our 52 ancestors? I’ve written my week 1, trying to get a head start. :) Hope I can keep up for all 52 weeks. Very excited about this. This is the nudge I need. I am going to do this and have a great idea on what I will work on. I have scanned many family pictures and plan to pic one or two at a time and write about the picture such as the occasion it was taken, and where, etc. And then write a few lines about the people in the picture. My question is to those that blog. Where do you go to set up a blog? There’s no need to blog to participate in the 52 Ancestors in 52 Weeks project/challenge. But if you are interested in setting up a blog, the two most common places are blogger.com (part of Google) and wordpress.com. Both are free and easy to use. Amy … Hi, and Happy New Year! I’ve been reading Roberta Estes’ most impressive (!) ancestor blogs this year, thinking I would ‘someday’ get a start on my own schedule of writing about some of the 7200+ family folks I’ve gathered into my FTM database over my 40 years of genie research. Yikes – at this point I’m no “spring chicken”. Time to start, and this is just the push I needed! Thank you! Speaking of starts, I have an appointment to have a phone discussion this afternoon with an adoptee on the other side of the country who shares DNA matches with both sides of my family. I’m starting by reviewing my father’s second cousins, since the strongest tendency of the matches is in that direction. Wish us luck. fingers crossed for you both, I’m still looking for my Dad’s bio parents. Your “confirm your address” email came, but it appears empty. When I hit “reply” I can see in the automatically included copy of your email that it contains a button to click — but I cannot get to that button in your incoming mail! Can you confirm my address through this comment? Or how else can we get around the technical trouble? Sometimes there are issues with AOL email addresses not showing the confirmation email correctly. I’ve confirmed it for you. Thanks! I just finished writing 365 blog posts in 2017, with 94 being about ancestors. This year I want a less rigorous schedule so will try to write about one ancestor per week. Then if I want to write more that week, I plan to write about siblings or cousins or share documents or photos. Writing has really helped me to get to know my ancestors and other relatives better. I’m so excited! I just finished writing about the first of 52 ancestors! http://kbmacgeek.wordpress.com. I look forward to reading everyone else’s posts that are doing this challenge as well. Thank you for this manageable form of inspiration, Amy! I just posted my first week’s entry to Facebook. I think that’s the platform I’ll stick to. (I have a blog, but it’s for local history matters.) I look forward to seeing what others come up with. I’m so glad this “challenge” has returned. It’s one of my favorites. I am really excited about this challenge. I started a day early. LOL!!! Just signed up for a try. I’m a terrible procrastinator and not inclined to write (altho I always seem to have plenty to say). Perhaps joining your blog will give me the “kick” I need to start sorting out the 40+ years of genealogy info I’ve collected here and there…………….Thanks for the opportunity. I’m so glad I found your blog! This is just what I need to keep me consistently writing about genealogy. Great tips mentioned above, thanks to all! Thanks for the kind words, Irene! You’re welcome! I’m working on my post and looking forward to reading yours! Hi, Lynda! How you share is up to you. “Sharing” doesn’t have to be with the whole world. It could be something that you share with your cousins, siblings, or children. I received your thanks and welcome e-mail. How do I receive the prompts? Hi, Wendy! Thanks for joining the challenge! You should have received the prompts by email. If you haven’t, let me know. As I was thinking of what I wanted to “start” with, I realized I already started this past weekend. As I took down my holiday decorations I photographed the decorations that I have belonging to my mother and wrote an article in my journal about them with photos. I thought the children and grandchildren might want to know that information someday. Not too long ago, my son said to me he hoped I wouldn’t just leave boxes of notes and info. That has encouraged me to do some sorting and organizing. Maybe this will also help, when I figure it out. After seeing 2 families of relatives toss out genealogy and photos, I vowed to do more than leave charts, databases and boxes of stuff. Hi Amy, Looking forward to again joining this and blogging… finally on my husbands family. Will you be offering any graphics to use weekly? Is it ok to use your top one with your name and site on it for my main photo? I have done the first post and have been going through twitter visiting and commenting on others from there. I have also been adding them as links on the sidebar of my blog. Amy, this is just what I need now. I have loads of information, but no one knows what I’ve found (and when I do try to share some info, eyes glaze over). I’d like to create a place on Facebook to share stories and fish for cousins, but I don’t want to use my current page, which is filled with work friends and others who would have no interest. What are the pros and cons of starting a new profile page for genealogy versus creating a group for my family? If by “profile page” you mean a new Facebook account (you’d have friend requests, you could join a group, etc), don’t do it. It’s against Facebook’s terms of service; they have shut down accounts for doing that. I think a private group for your family would be a good solution. (I have one for my cousins and it has worked out well.) There is more opportunity for interaction, which is great for getting the family members to contribute, too. Amen! Write the stories. Somebody will appreciate them, someday. Amy, thank you for sharing this challenge! I signed up a few days ago, but I haven’t received correspondence regarding #52Ancestors. I’ve checked my spam folder, too. Saw this suggested on Roberta Estes’ blog and am hoping this will be the kick in the pants I need to revive my own, sadly neglected blog. Did I miss the first week’s prompt because, as usual, I am late to the party? Hi, Teresa. Can you send me an email (support@amyjohnsoncrow.com should work) and tell me what email address you used to sign up? Thanks. I also wonder how to find the prompt for week one since I first heard about this after 1/1/18. Thank you. The first prompt was “Start.” The rest of January’s prompts are in the email you got today. I never received my 2019 January prompt either. Glitch or ? My cousin, Virginia (McCormick) Brannen (1950-2005); her mother, Ruth (Exley) McCormick (92 years old and still interested in genealogy); and her father, Leslie (Mack) McCormick (1922-1989) were the first ones to inspire my interest in genealogy. They put a lot of effort in researching our family history, taking pictures and recording family stories They firmly believed the old Chinese Proverb “to forget ones ancestors is to be a brook without a source, a tree without a root.” Before her death, Virginia put together a book of family history, stories and pictures so future generations would know about their ancestors. She challenged family members to continue her legacy. When I retired in 2014, decided to accept Virginia’s challenge and began researching our family history. My ancestors came from Austria, Bavaria, France, Germany, Scotland, Ireland and England. My father’s ancestors settled on the banks of the Savannah River and my mother’s ancestors settled in Texas. Both branches of my family immediately became a part of the new country. They were farmers, storekeepers, teachers, lawyers, nurses, doctors, businessmen and loggers. They worked hard, they played hard and they were (and still are) fiercely proud of each and every family member. I am honored to be descended from this stock and proud to share what I have learned about our family history with other family members. Hi! This is my first time to do this. I have been doing genealogy for about 20 years. Before that I helped my mom a little bit. Thanks to her and a lot of her letters hand written or type written for information from different organizations and getting stories from the older generation and family information that I can keep the torch burning! Sometimes I just come to a road block and just have to put it all up for a little while. This 52 in 52 will help me keep going! Thanks! I’m preparing a Newsletter that will be sent out to members in the next week. I’m working on a short bio of a gentleman who has been very active in the Organization over the years. He passed away this fall. I hope to use some of the prompts as I prepare the newsletter 4 times a year. I simply put my first story in a note and publishef itto Facebook. I have done this previously with some of my musings. Would it be better to do a blog? I an add pictures to my Notes and get comments from family and friends, using Facebook notes. Please let me know if there’s an accompanying graphic to include on our participating blog site. Joining in for the first time. My Mum in the UK has tracked our family back to the 1500s. I am a memory keeper and digital artist in the United States. We’re going to combine our skills and the power of technology to create a 52 page photo book with stories about our family. I’m looking forward to this challenge! Thanks! “Start” but where? Traditionally, in the place as far back as the documents take us. Instead, I decided to start with the family storyteller without whom it is very likely their would neither be the interest and substance for our writing efforts. In my case that is my mother’s sister Lydia who came out of Russia with our Sattler family in late 1911. Lydia could keep us rapt with tales of that escape and other family events. At an age well over 80 and with little formal education, she decided that she would write her memoirs and did write 50 plus typed pages. Although she died over two decades ago, it is like she is in the room with me when I read her memoirs. She understood voice very well. I am integrating her writing into my work to provide glimpses into unique moments in the life of the family available nowhere else. I place it within a structure which provides background and details needed to better understand these events that younger family members lack. Thanks for Auntie Lydia and all family historians and storytellers. They give us our start! I began my Diggin’ Up Graves blog in 2014 at the start of the first 52 Ancestors series. It has made me a better researcher and writer. Back then, Amy, we could post our links to our articles (if they were online) in comments to your posts about the 52 topics. Is that the same now? I participated in the 2014 Challenge and part of 2015. 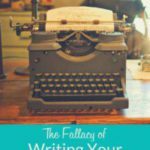 It was hard trying to write 500 words for a blog. Especially since I couldn’t stop researching while I was writing. I vow this time to be consistent and keeping it simple. I’m going to be a day late loading #1. I have written it, but ran out of time to load it today! Wow, this is great! I joined with some apprehension but today I started my genealogy blog (never blogged before) on WordPress and it was easy. I am sharing my blog link with my children ( I am 71) and relatives so we all can learn family history together. I will really, really try to blog each week following the prompts! Thanks to all of you for all the comments and suggestions – I read them all and was inspired! Thank you Amy. This has been a great motivation to work on documenting my family history in a meaningful and interesting way. It may even become a book – I wish. Well, it is up to me and me alone to achieve this. And YES I can. I’ve made a START – whooppee!! Feeling buoyed and positive. Looking forward to the challenge. So for this week I will think about the following four weeks too and what, where, when I might find the meat to put in each sandwich. And not just make a sandwich, BUT make a delicious one. Wow it takes a lot of scolling.so many great posts! Hope to make it through this 2018 with you dedicated people. I’m 80 going on 100 and just became interested in genealogy 2 years ago, a little late to the party. It love photography and cleaning up old photos so i will be workino mostly in this venue but need to fill in gaps in my trees. If started using Amy’s Excell sheets which gives me a clear idea of where i need more seaching. Thanks Amy and all of you in advance for more ideas and break throughs. I am so enjoying this project. The creative juices are flowing this new year. What a great opportunity each week to think another story about our history. I just learned about this yesterday. I have to go back and finish last week. As a result of this challenge, I have just started a private Facebook page, The Lynch Family. I have invited all the family to participate and will use it as a vehicle to post pictures and family stories. Thanks for the push I needed! I am enjoying the Challenge but I can’t find a list of the weekly topics. Can you help with that problem. I’ll resend the email to you. Well, I have finished week 1 and am moving on to week 2. The photo that I have chosen brings forth many stories which I will capture in my notes, but I need to focus on just one of these. To me, the one that seems most poignant to me is that idyllic period in the life of the family which will be short-lived and end with the death of the mother in 1920. She is the grandmother I never knew, and the mother that my mother would have present for under seven years, Her death would lead to many changes for the family and particularly for my mother. Here, personal reflections will be important. Week 2 The photo I chose was me as a child wearing a family heirloom – a Romanian embroidered jacket for participation in the talent show on board a ship to Europe and Israel in 1963. Many years later I learned that it originally belonged to a cousin who now has it stored somewhere. Hi Amy. Just learned this morning about your 52 Ancestors in 52 weeks in my genealogy group. I signed up and am looking forward to getting started. Okay, I signed up. What do I do now? I’ve never done a blog and don’t know where to start. Can I get the week 1 and week 2 prompts, now that I’m late starting, and make them up so I’m not behind? Not very techy. Have been reading Roberta Estes posts on her past 52 project and saw her blog post about this new project…so here I am. I’m slow so not sure how well I’ll keep up or how interesting I’ll be. Pingback: “Start” (again) – Week 1 – Are My Roots Showing? For Week 2 I blogged on a photo of my great-grandparents in Norway with three of their 11 kids. I have started just about finished with week one, found a number of my favorite photos for week two and organizing information for week three. Thanks again! Just signed up but it is a breath of fresh air that will help get over the frustrating week I have had at Ancestry. Have been trying to beef up my tree while my DNA is tested however, ran into a person that has a humongous tree and although she claims any corrections are welcome she doesn’t and ignores all notes and messages. In the meantime her tree grows bigger with the chunks of other trees, records and photos she copies and doesn’t check anything to make sure it is correct. I tried to help her but her tree is such a mess it is beyond help… and as I said she ignores you after the first contact. It frustrates me that she has ‘taken’ some of my photos and made my great grandfather a bigamist (others too) and given my grandfather step siblings… that sort of thing but I am not the only one she has done this too. “Can longevity mean more than just the length of an individual’s life? I think so. I see lives remembered long as, a sort of longevity, too. can anyone tell me since I am new to blogging, is there any way to actually create a timeline to put ancestors on a “line” (either horizontal or vertical) to create the mental picture needed (for self and family who may not be familiar with who comes after whom)? Thanks – I enjoy participating – hearing what some have accomplished and those just starting! Twile.com is an excellent way to make an ancestral timeline that you can share with your relatives. It wouldn’t be on your blog, but it’s super easy to create — and you can be as creative with it as you like. My week 4 post is up. I was really excited when I thought about sitting around the table to be able to ask those questions that escaped us. And there are many options here as I thought about it. I might write additional posts related to this theme, but for now, it is posted: http://hannigan.info/archives/50145. Hope everyone reads the other weeks also and where possible leave comments to encourage writing about our past. That’s a great story about your dad and Grandpa Roy! Thanks for sharing! thefamilytapestry.blogspot.com I have only just started and am thrilled to be back in writing mode using this wonderful incentive. I had to put it off for awhile which has meant that I am now trying to catch up. I have published on Blogger 3 out of 5 – see link above. Still tidying up ‘In the Census’ and then ‘Longevity’ to do. By then it will be time for the next one. Thanks Amy for getting me back on the ancestors road. Welcome to the Challenge! I hope that it proves useful to you 🙂 And don’t worry about catching up. The point is progress, not stress. 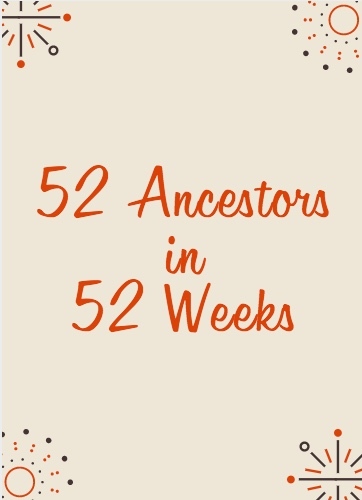 I wish to join in the 52 Ancestors in 52 Weeks. I know I am a few weeks behind everyone else, but I am ready to get started. WOW! What a wonderful idea. I’m working two jobs right now, approx. 70 hrs per week, but I think I can do this. Thank you so much!!!! Great idea, Amy! Can you share a few examples? Can I jump in at any time? Thanks! Peter. Yes, you can jump in at any time and no need to “catch up” unless you want to. I used to sit at my computer and write about growing up with my brothers and cousins mostly in one block in the city. I had about 15 different “stories” and when my daughter and I decided to do something about it, we ID’d and scanned all our old photos and she put them together with the stories and I have an album now that has about 90 pages. Each of my kids has a DVD of the book in case something would happen to the book. Priceless! I am so excited to start another year. Trying hard not to repeat anyone! I hope to do much better this year than I did in the challenge in 2018. Might even schedule posts so I am at least ahead of myself. Remember: the goal is to write/record/do/make something. Anything you do is what you had before — and I call that progress! Hi Amy, is there an image or a badge for the 52 Ancestors in 52 Weeks challenge that we can use on our blogs? I am going to try this again — have started it many times in the past, missed 2018 completely. Here’s to looking forward and finding joy in the journey. #findjoy2019 Going to use this to help me finish a book I started many moons ago. Keep your fingers crossed. “Finding joy in the journey” — I love that! I hope that the challenge works well for you! Hi Amy — I haven’t seen the prompts yet? I got your welcome email but it didn’t have the January prompts. I’ve looked in my promotions box, I’ve gotten a few emails from you but nothing that includes the prompts related to the challenge. Any suggestions? Thanks. When will we receive our first prompt? I am very excited to be doing this for the first time and I am eager to get started while I have a little bit of time off work. The January prompts were in the “welcome” email. (The subject line is “52 Ancestors in 52 Weeks – Let’s get started!”) Please check your spam folder to see if it went there. Amy, I never received the email. Not in the spam folder either. I notice that you’re on Gmail. Look in the “Promotions” inbox. If it’s there, drag it into your Primary inbox; that usually helps Gmail deliver future emails better. If you don’t see it in any of your Gmail inboxes, send me an email at support@amyjohnsoncrow.com and I’ll see what I can do. Amy I never received that email and I have checked my spam. I’m new to the 52 ancestors challenge. Thanks for doing this, it will push me to think more in-depth about what I am researching and hopefully find more answers. Happy New Year! I only realized this evening that the confirmation e-mail was in my junk folder, so I did not respond until now. I’m very interested in the 52 Ancestors/52 Weeks curriculum, but wonder if I’ve missed the beginning? Thanks. I have done my second post on Challenge…but don’t have any place to link it to but here. ? My WordPress account is not where I’m currently blogging. ThreeFamilyTrees.blogspot.com is one of my blogs. Of you signed up last year, do you need to sign up again? No need to sign up again if you received them in 2018. (I’ve sent out emails already for 2019. If you haven’t received those and you think you should be, please send me an email at support@amyjohnsoncrow.com and I’ll take a look. Oh my gosh! I have been emersed in my genealogy since 1980. What a great opportunity to put it out there and share my joy of writing. This is a great way to organize my thoughts and information. Thank you! Yes, I'd like to sign up for 52 Ancestors in 52 Weeks! Get a weekly prompt and monthly recaps!